MANILA, Philippines - Filipino boxing champion Manny "Pacman" Pacquiao has confirmed that negotiations are ongoing with the camp of unbeaten American Floyd Mayweather Jr. regarding a possible mega-fight. "Ongoing ang negotiation sa fight namin ni Mayweather, hindi pa final (Negotiations are ongoing for my fight with Mayweather, but nothing is final)," Pacquiao said in a press conference after his homecoming in General Santos City. Pacquiao said that Mayweather may be more eager to fight him now, after his fight against Mexico's Juan Manuel Marquez last November 12 in Las Vegas. Although he won via majority decision, Pacquiao was not his usual explosive self, and admitted that Marquez's counter-punching style gave him trouble. Many analysts and observers have said that Marquez deserved to win the fight, rather than Pacquiao. "Nakita n'ya Mayweather na, 'pwede ko na labanan si Manny, dahil medyo nahirapan s'ya si Marquez, e si Marquez, binugbog ko Mayweather lang'," Pacquiao said of Mayweather. (Mayweather may be thinking, I can fight Pacquiao now because he had trouble against Marquez, and I was able to beat up Marquez). Mayweather routed Marquez completely when they met in 2009. It was reported earlier this week that Pacquiao's adviser, Michael Koncz, had traveled to Las Vegas to meet with Top Rank chief executive officer Bob Arum regarding the Mayweather fight. Pacquiao is hoping that the negotiations will fall into place so that his much awaited mega-fight with Mayweather will finally happen. "'Yan ang pinakaa-abangan ng boxing fans," he said. 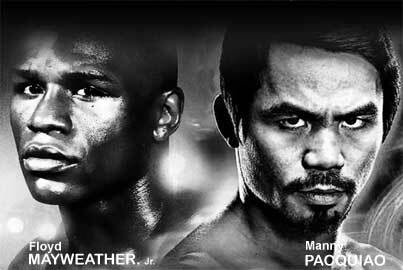 (This is what boxing fans are waiting for). Pacquiao returned to his hometown of General Santos (GenSan) City Thursday, but unlike his other homecomings, he was not accompanied by his mother Dionisia. The boxer said his mother was still sick. The Sarangani representative was greeted at the airport by GenSan Mayor Darlene Antonino-Custodio. Although there was a motorcade for Pacquiao, fewer people came out on the streets to greet him.